Yes you read that right. The IRS plans to go forward with hiring Equifax to verify and validate taxpayer identities in the wake of their massive systems breach. If you missed the news (because apparently the IRS did), hackers were able to obtain confidential financial information—including social security numbers—of 145 million users; which now equates to the largest US data breach in history. The IRS continues to defends it’s choice, stating that the service Equifax was hired for will not put U.S. taxpayers personal information at risk. They will, however, keep a watchful eye on their new hire. If you have been affect and/or would like to find out if your were affected by Equifax’s breach you can do so by clicking here. However, we advise caution before using services to ascertain Equifax exposure. According to the terms and conditions, users that access Equifax’s systems to determine if their information was compromised are voluntarily giving up their rights to sue and/or join class action lawsuits against Equifax. If you would like more information about this breach or would like to to speak to an R&G Brenner professional, contact us toll free at (888) APRIL-15 or via web by clicking here. While the details are just emerging and the final plan is sure to change, the tax overhaul that Trump & the Republican party recently unveiled has clear beneficiaries; and early indications are it is NOT the “middle class”. In fact, according to this analysis, Trump’s tax plan will see the majority of the benefits—i.e. tax cuts— to the rich; particularly the top 1% & 0.1%. In Indianapolis last Wednesday, Trump outlined his proposal and stated, “…the biggest winners will be the everyday American workers as jobs start pouring into our country, as companies start competing for American labor and as wages start going up at levels that you haven’t seen in many years…”. This is your classic “trickle down economics” argument that has been made for decades; that by cutting taxes on big businesses and the wealthy, the average American worker will see the benefits work their way down to them in the form of higher wages and more jobs. The only problem is that study after study has shown these benefits never really reach the middle class. Staying true to theory of trickle down, Trump proposes slashing taxes dramatically for Americans who earn north of $730,000 a year. What’s in Trump’s Tax Plan? Reduce the tax bracket from seven brackets to three: with tax rates of 12%, 25% and 35% percent with a possibility of adding a fourth bracket. Doubling the standard deduction from $6,000 to $12,000 for individuals and from $12,000 to $24,000 for those married filing jointly. Creation of a new tax credit for non-child dependents while increasing the current child tax credit. Elimination of most itemized deductions but keeping the mortgage interest and charitable giving deductions. Tax incentives for retirement saving and education plans will be retained; i.e SEP, Traditional, Roth IRA’s and 529 college saving plans etc. A new tax rate of 25% for “pass-through” income for businesses like sole proprietorships and partnerships which currently make up nearly 95% of all businesses which are taxed at the rate of their owners. Preserves tax credits for research and development and low-income-housing from a business standpoint. Although the tax plan has a vast amount of changes for individuals & business on many levels, the benefits overwhelming favor the affluent and business owners. How is the Public Reacting to the Trump Tax Plan? Opponents like Edward D. Kleinbard, a tax expert at the University of Southern California law school calls Trump’s Tax Plan “a very cynical document…The extraordinary thing about the proposal is that we know that it loses trillions of dollars in revenue, yet at the same time the only people we can identify as guaranteed winners are the most affluent.” Even Republican Rand Paul recently came out against Trump’s tax plan calling it a “middle class tax hike”. This analysis from the Tax Policy Center above clearly illustrates how the current tax proposal favors the wealthy; particularly the top 1 percent and top 0.1% them. Pay particular attention to the Share of Total Federal Tax Change. It breaks down U.S. income earners into 5 categories—from those making the least in the lowest quintile to those making the most in the top quintile. As you can see, the top quintile reaps a whopping 86.6% of these potential tax cuts! The other 4 quintiles combined would only realize 13.4% of these cuts. Parsing these numbers even further for the top quintile the majority of tax cuts go to the top 1% (79.7%) and the top 0.1% (39.6%) which equate to an average tax cut of $207,060 & $1,022,120 respectively. Most Americans don’t even come close to earning the amount of money the top 1% would gain in tax cuts. Time & time again, Trump has pledged on the campaign trail and as President that the middle class will see the rewards of his tax cuts and it was time for the rich to pay their fair share by closing tax loopholes amongst other things. However, it is hard to come to any other conclusion than this tax plan, if passed, would overwhelmingly benefit the wealthy and not the middle class. In fact, this plan may create even more tax loopholes that would directly benefit wealthy families. How Does Trump’s Tax Plan Affect You? If the previous health care battles are any guide, the political fight to get these cuts enacted will be fierce and has only just begun. This means that the ordinarily taxpayer can most likely expect tax filing delays—similar or worse than in recent years—while congress bickers…especially for taxpayers who file early. It will be a while before we can really dig into the ultimate affects of whichever Trump’s tax proposal is ultimately passed. One thing is for certain: In it’s current form the only real beneficiaries to this proposal are those that make nearly a $1 million or more annually. Because of all this uncertainty and the prospect for an increase in taxes for the middle class, hiring the services of a Tax Professional this tax season may be well worth the money as they can help you navigate this complicated tax climate as well as potentially unlock benefits you might ordinarily overlook. If you’d like more information about out how Trump’s existing or eventual tax proposal will affect you, feel free to contact us via the web or call us toll-free at (888) APRIL-15 to speak to an R&G Brenner Tax Professional. Please feel free to comment below on Trump’s proposed tax overhaul. Taxpayers can download forms and publications from the official IRS website, irs.gov, or order them by calling toll free 800-829-3676. Contact an R&G Brenner tax professional if you require assistance; (888) APRIL-15. Likewise, the IRS is offering tax relief for those affected by Hurricane Irma. The IRS has implemented a significant change to Partnership tax returns. In past tax seasons, the due date for Partnerships was the same as the due date for personal returns; usually around April 15th. However, starting for tax year 2016 (calendar year 2017) the new due date is March 15th. If you file Partnership tax returns In order to avoid processing delays as well as any late payment penalties and potential interest charges, be sure your return is e-filed or postmarked by 11:59pm on March 15th. If you have any questions or would like assistance filing your Partnership or other business or personal tax returns, please contact us toll free at (888) APRIL-15 or contact us via the web. At R&G Brenner, one of our cardinal rules is that we try to remain apolitical. Simply put, the acrimony and division exhibited these last few elections cycles has clearly increased in frequency & intensity. R&G Brenner services thousands of clients across all political spectrums, and it is simply not good business to potentially upset even one of our clients. However, when speaking about a subject like health care, it is impossible not to dive into politics; and this is really is the crux of the problem: How did health care become such a political lightning rod? Furthermore, is a “for profit” health care system sustainable or doomed for failure regardless if one thinks “Obamacare” or “Trumpcare” is better? These questions are all made exponentially more difficult living in a time when “fake news” has distorted fact from fiction. Nevertheless, here is an attempt at answering these questions, and why the conclusion will show that regardless of the ultimate outcome of “Trumpcare”, “Obamacare” is under attack from many different angles & being starved; all but ensuring it’s failure. A quick trip down memory lane: The year was 2009. President Obama was greeted with the worst recession the U.S. ever experienced. Stocks plunged. Banks & Financial firms disappeared. Savings evaporated. Millions lost their jobs. Hundreds of thousands walked away from their homes. It’s easy to forget how serious the state of the global economy was in. On the surface, it was puzzling to many pundits and pols alike why Obama’s first order of business would be health care reform as opposed to focusing on the economy. 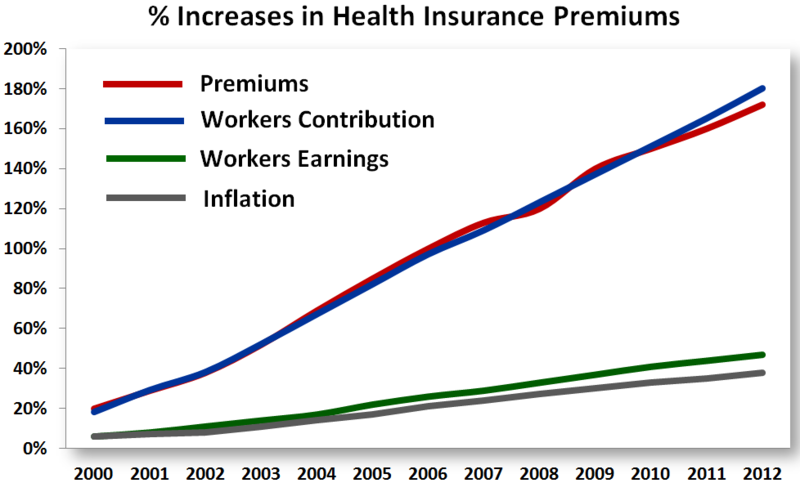 However, when you look at the data that health care expenditures made up a whopping 16.5% of the U.S. GDP in 2009, health care premiums were skyrocketing every year, millions of Americans could not obtain health care due to preexisting conditions, millions more used the hospital emergency room as their primary health care provider (and many didn’t or couldn’t pay the bills) contributing to the rise in overall costs, it’s not hard to see that health Care reform was not only an economic issue, but also a moral one. I think everyone would agree that no American should ever have to decide between living under crippling debt…or dying. Obama decided that he would expend his political capital on Health Care reform; and expend it he did: Political incitement & fear created a growing chorus of socialism, death panels, birther conspiracy theories, Obama negotiating in “secret”, “ramming it down the American people’s throat” & “keep the government out of my Medicare” (Medicare is government run) which eventually gave rise to the Tea Party movement and ultimately cost the Democrats majorities in both the House & Senate. While the truth of these claims can (and have been) debated ad nausea, what can not be debated is that these were clearly politically effective tactics. Nevertheless, the Affordable Care Act (ACA) became law and was subsequently upheld by the Supreme Court. It has been a political lightning rod ever since. Fast forward 8 years and enter “Trumpcare”; currently known as the American Health Care Act (AHCA). On the campaign trail and throughout the early days of his administration, President Trump has called Obamacare a “disaster” and promised to replace it with something “terrific“: more choices, cheaper plans, greater coverage & “insurance for everybody”. These lofty promises would be considered extremely difficult even with a unified party. However, not much is known about Trumpcare. Why? Well, because nobody really knows what in it yet as it was negotiated in secret and rammed through committees in the dead of night; all before the non-partisan Congressional Budget Office (CBO) assesses the bill. This irony is not lost on Democrats or anyone who is watching the GOP engage in the very tactics they howled about when the Democrats were the majority party in power. But, this type of hypocrisy has become the norm in today’s political landscape. Besides, it is no guarantee that Trump will be able to garner the support he needs from his his own party to pass an Obamacare replacement (and its foolhardy to believe he can rely on any Democratic votes). Simply put, the steady diet of questionable fear-based claims that were fed to GOP/Tea Party constituents essentially amounted to Obamacare destroying the fabric of American values. This type of absolutist rhetoric makes compromise not only a dirty word, but down right impossible; not only with bipartisanship, but within the Republican party. What the recent town halls in Republican districts have shown, is that the fear surrounding an Obamacare repeal and losing health insurance is very real. While it’s not wise to judge a bill before it’s final form it is very hard to see how Trump will be able to keep his promises of a “terrific” health care plan when his own party is unable to agree & unify behind a legitimate alternative; especially when estimates show up to 10 million may lose their insurance coverage under the AHCA. This puts the GOP is in a very tenuous position; will they be able to overcome all the roadblocks they have created for Democrats which they now find in their own way and deliver on their promises? Or will the chickens come home to roost? Regardless of the fate of an Obamacare replacement, this much is clear: Republicans are playing a very dangerous game. “Death panels” never were a real thing. But if the GOP passes a bill that takes away or makes it impossible for someone previously covered under Obamacare to get insurance, that is playing politics with American’s lives. Trump appears to be discovering that Health Care reform is very complex. Obamacare is a huge piece of legislation that took months to complete. It became clear after the ACA was implemented, that improvements were needed as the flaws began to reveal themselves. But at this point, bipartisanship changes to a a law that passed with a single Republican vote was a fantasy. Rather, Republicans dug in their heals and tried & failed to get Obamacare repealed…62 times. Republican resistance centered around a) making Democrats own Obamacare entirely; something they proclaimed would be an immediate failure and b) accepted dogma that everything the government does is bad and everything the private sector does is good. While there are certainly valid reasons to pare down government, the notion that EVERYTHING the government does is bad has proven to be false: Police & Firemen do not ask if you paid your taxes before running into a burning building or replying to a distress call…and nor should they. But this is the corner the GOP has painted themselves into. As a result, since Obamacare’s inception, more and more insurance companies have left the insurance exchange markets. Those that railed against Obamacare have warned for years of a “Death Spiral”; that costs and care would spiral out of control and lead to Obamacare’s demise. However, doing nothing to improve the law and making it unattractive for insurers to stay in the exchanges was also good way to ensure this self-fulfilling prophesy. Nevertheless, the “death spiral” didn’t occur; even with this methodical chipping at the foundation which the ACA was built upon, Obamacare still survives…that is until now. In other words, the IRS has interpreted Trump’s executive order and will no longer reject tax returns that do not indicate their insurance coverage status. Furthermore, Trump has indicated he may not to enforce the individual mandate. Critically, the decision to Repeal, Replace or do nothing to Obamacare is irrelevant. Coupled with the insurance companies fleeing the exchange markets, failure to enforce the individual mandate will surely spell the death knell of Obamacare. Why is this so dangerous? Well, In the 7 years of fighting tooth & nail against anything short of repeal, Republicans did not offer a single alternative plan until they were forced to a couple of weeks ago. Trump & the GOP has already set the doomsday clock in motion on Obamacare; all without a viable & workable alternative in sight. Furthermore, Trump doesn’t seem troubled by this. During a recent meeting with Conservatives, Trump’s nonchalant message was thus: Don’t worry, if our bill fails, we’ll just blame the Democrats. Not only is this an extremely cynical approach, its extremely irresponsible. Regardless of political affiliation, as a human being, this should not feel right. Being in the minority “opposition party” has proven to be politically beneficial; its easy to criticize when you are not expected to offer alternatives. However, now that the GOP is in power, will they bare the level of responsibility expected of the majority party. Early returns suggest they will not. Will the GOP be able to shirk the blame for destroying Obamacare and pretending it “failed on it’s own”? Will the GOP decide it is better to let Obamacare fail then to take the political risk of owning their own replacement? Is it even possible to sustain a “for profit” health insurance system? Is the only viable solution a single-payer or “Medicare-for-all” system? Absent a congressional “Kumbaya” moment of coming together for the greater good of the country (which does not seem possible for the foreseeable future), we may soon get the answers to all of these questions. The only remaining question is: will the majority party in power risk the lives of thousands—even millions—of Americans to reveal these answers? This is the most frightening question of all.